Emotions are powerful. They can be our friend or our enemy. Problem is many of us don’t know how to process them properly. We tend to either externalize or internalize our emotions. We take out our frustrations on others, over-react to minor problems, use substances to assuage our feelings, alienate ourselves from loved ones, or my all time favorite – NOT – resort to passive aggressive behavior. In this post, we will discuss the emotion of anger and how to identify if we or someone we know has an unresolved anger issue. 1: You’re in driving in the car and someone lays on the horn, tailgates you, or flips you the bird. 3: You’re waiting in line at the bank, post office, or grocery store, and the line is not moving. 4: You’re at a restaurant and the food is taking forever to arrive. You’ve lost track of time because you are in deep conversation and realize it’s been over 25 minutes. Anger is a normal human emotion. We feel angry for a reason, but sometimes the reason we are angry is not the reason we think. When we have a very strong reaction to a particular situation or person, chances are there is something going on way beneath the surface that needs to be addressed but the current situation gets so blown out of proportion, the real problem never gets identified. Here’s a personal story to give you an example of what I’m talking about. Many years ago, when my oldest son was still in college, I was in bed reading a book when my oldest son walks in. A little background here, my son is brilliant. He has what his teachers call a photographic memory. He never really had to study much in high school and aced all his exams with little effort. He was home visiting for the weekend. “I’m fine. What’s up? You look a little down,” I observed. “Yeah, I didn’t do so well on my exam today,” my oldest darling replied in a dejected tone. “I’m leaving,” he announced, slamming the door as he bolted out of the house. Wow! Wonder why he reacted like that. It was a simple question. Several months later, I found out the real reason for the sudden display of anger. Alexi had lost his scholarship by not keeping his grades up. So, if you find yourself over-reacting to minor situations, venting to anyone and everyone who will listen, distancing yourself from a loved one, or having a strong desire to over-eat, drink too much, or do anything else to excess, there might be an unresolved anger issue lurking deep within. Remember, anger is a signal that there is an issue that needs to be addressed. It is not something to be ignored, denied or ashamed of. “Be angry, but sin not,” it says in scripture. Next week we’ll talk about how to handle unresolved anger, but in the meantime, let me know if this post was helpful and remember to keep looking up! Some questions should never be asked. “Why are you still single?” is one of them. Hint: if you are married, NEVER ask this question of a single friend unless you no longer want to have them as a friend. Let’s face it – we live in a couples’ world. Everything is set up based on two people. This fact came home pretty hard this past week. “No, I am not married or cohabitating,” I replied. Now I know many married folks would love to be single again. However, as glamorous and exciting as it may seem, being single is not all that easy or glamorous. The full load of all life’s responsibilities falls squarely on one person’s shoulders and that is quite a hefty burden to bear. Take heart, friends.You are not alone and, as a long-time single, I am here to tell you it is possible to survive and thrive as a single while you are waiting for Mr. or Ms. Wonderful to come along. Below are 5 tips I’ve learned over the years that help me focus on the positives when my mind wants to focus on the negatives of the single life. 1. Be thankful for our singleness. Yes, I know it is difficult at times, but as a happily divorced lady, I can tell you being single is a heck of a lot better than being in a bad marriage – by far! As the apostle Paul stated in Phil 4:11 “I have learned to be content in whatever circumstances I am in.” Paul went through some pretty tough situations and he was single. If we think our lives are tough, imagine being in his shoes. 2. Remember that God has a plan for each of us. Sometimes it takes years for God’s plan to be revealed. Honestly, I think it has a lot to do with the lessons we each need to learn. In the meantime, discover your gifts and begin using them for the glory of God to serve other people. We each have gifts and when we get out of our self-centered selves to focus on other people’s needs, we will be filled with joy, purpose, and less time to have a pity party. Clean out your house, your garage, your closets. Get counseling to get rid of your old baggage. In other words, get rid of all the material and emotional clutter. Many singles I know are out every night of the week or working so much they have no time or room for a significant other. 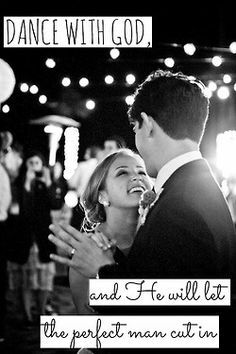 If you want God to bring you a partner, you best have the time and energy to devote to him or her. Now I know many of you, gals in particular, feel like the clock is ticking. Every time some guy asks me how old my kids are I think “Here we go again…”. I tell them straight up. I don’t believe in hiding important facts. The truth is going to come out sooner or later and better to deal with issues up front than after you become emotionally attached. Mr. Right will love you for who YOU are and if he doesn’t then he is not your Mr. Right. Next! It’s easy to take things into your own hands and make things happen on your own timetable. But resist that urge. God sees the big picture. He is working behind the scenes preparing people. Focus on healing yourself and making yourself the best you can be. The more issues you clear out of the way beforehand the smoother your relationship with Mr/Ms Right will be when the time comes. Ok, I hope these tips are helpful. Love to hear your thoughts so please post a comment. No matter what our status is, each day is a gift. Until next time, keep looking up!